It is June, so the students are not on campus, but the Band Directors are hard at work planning the shows for 2016. Despite little activity on campuses around the country, there is still a lot going on in the news. 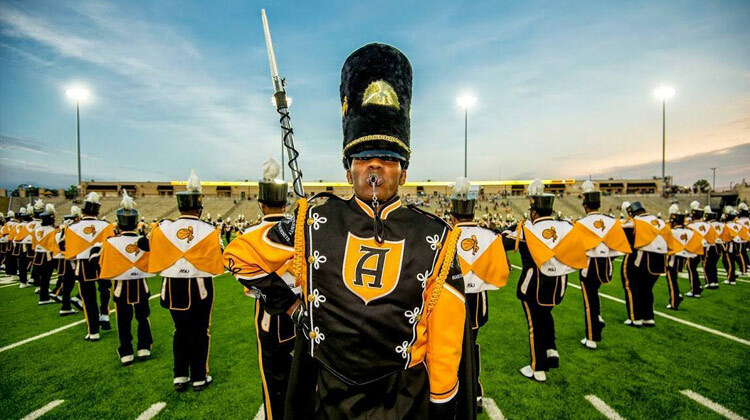 The Alabama State Marching Hornets will in the new Vin Diesel movie. The Marching Hornets shot a scene for the new movie "Billy Lynn's Long Halftime Walk", which stars Vin Diesel, Steve Martin, and Chris Tucker. South Carolina proposes a band friendly law. A South Carolina state senator proposed a law that would make marching band participation count toward Phy. Ed. credits. The Chicago Tribune loves marching bands. The Tribune tells us why they love college football, and marching bands are a big reason. Penn performs Hamilton. Marching Bands don't just march, they also perform musical theater songs really well. George Mason supporting one of its own. The Band is helping raise money for a band member, who was recently diagnosed with cancer. That is all for now, March On!